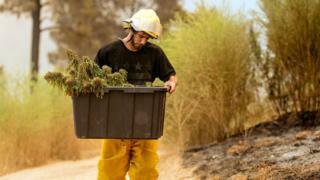 Crowdfunding efforts to help legal cannabis farms damaged in California's wildfires have been closed down because of fear of contradictory national laws. More than $13,000 (£10,000) was raised for the dozens of businesses. Medical cannabis is already legal in California and it is set to be sold recreationally from January next year. However under US federal law it is illegal to manufacture, distribute or sell the drug - making it difficult for legal growers to get help. As it stands 29 US states allow medical cannabis and eight have approved recreational use - but it is still classed as a schedule one drug nationally, alongside other drugs such as heroin and ecstasy. The crowdfunding website, Youcaring, said they had no choice but to cancel the fundraisers because fundraising for cannabis-related purposes is banned by its payment providers, WePay and PayPal. The fundraising could technically be classified as money-laundering under the federal laws, despite the businesses being legal within the state of California. It had been set up by Hezekiah Allen, executive director of the California Growers Association, aiming to raise $25,000 for at least 34 businesses affected, according to CNN. The US justice department released guidance in 2013 instructing federal prosecutors to not pursue cases where the state allowed the action, and other federal agencies have had to issue similar guidance on how to operate legally within the contradicting laws. Special instructions had to be issued to banks on how to work with legal cannabis businesses subject to strict conditions and monitoring. But a lot of banks have been unwilling to do so, meaning many legal businesses have had to operate totally on a cash basis without banking access. The legal industry is growing rapidly, and is predicted to be worth over $20bn by 2021.